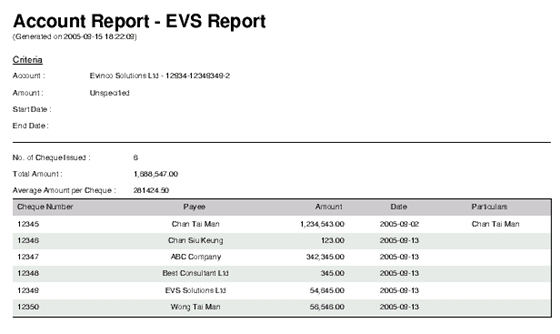 In the Report page, there are two types of report: Account Report and Payee Report. New - Create a new report. View - View the selected report. Delete - Delete the selected report. 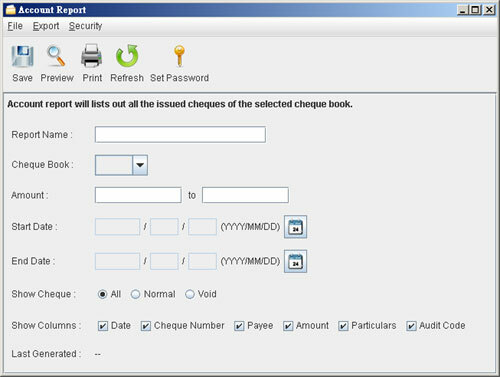 Account report provides cheque issues information on the selected account. User need to provide a report name for the report. The report will run against the selected account and retrieve all the cheques under it. You can leave the amount and date field blank if there is no limitation on them. Note: - The report will be updated every time the report is saved. The updated time is shown as the "Last Generated"
The sample PDF output is given below.